I love going out for afternoon tea, it’s one of my favourite ways to spend an afternoon. So when Halesowen Golf Club asked me if I’d like to take tea in their clubhouse, I was only too happy to accept. As Mark was able to take a few hours out of his busy schedule, we spent a lovely afternoon chatting away over afternoon tea looking out at the view above. And you won’t believe what excellent value this afternoon tea was – read on to find out more! Halesowen Golf Club is located a few minutes drive from Junction 3 of the M5, so its very easy to get to. Driving through the roads of Halesowen, it was hard to imagine that there was a golf course anywhere near by. But as the sat-nav directed us down a side road, we discovered that the long sloping driveway took us down to the golf club, which has plenty of parking outside. 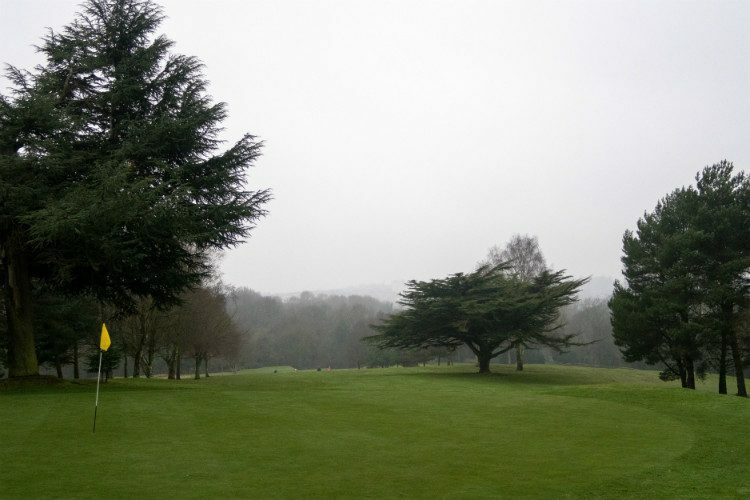 The club is set in Grade 1 English Heritage grounds, with views out over the Clent Hills and Worcestershire countryside. And the Georgian club house dates back to the 18th century. It’s Grade II listed, and was once the home of landscape designer and poet William Shenstone. Although the golf course is members only, the club’s restaurant is open to the public, and you can book a table by phoning the clubhouse (details at the foot of the post). Unfortunately the weather wasn’t on our side when we visited and the sky was a relentlessly flat grey. So the photos really don’t do the surroundings any justice. Later on in the year, the clubhouse will be festooned with a mass of red foliage that looks absolutely stunning! After a brief look around in the light January drizzle, we moved into the clubhouse restaurant for tea. It was rather quiet as we were the only people taking tea at that time. But with views out over the course, it was a lovely place to sit and relax. And on a warmer day, we could have sat out on the terrace, which would have been even nicer! In my view there are some things that are non-negotiable when it comes to afternoon tea . You have to have little sandwiches (no crusts! ), there must be scones with jam and cream, and the meal has to be topped off with dainty cakes and fancies. Plus of course, there must be plenty of tea. Every establishment puts their own particular stamp on the occasion, whether it’s adding savoury delicacies to the tea-stand or serving cocktails in tea-cups alongside. At Halesowen Golf Club, they like to keep things traditional. Our afternoon tea was quickly brought out to us by Cathy, who looked after us wonderfully during our visit. It included not one, but two tea stands laden down with goodies. The sandwiches were made with soft, fresh bread, and filled with a variety of fillings including ham, cheese, tuna mayonnaise and egg mayonnaise. The top layer included two scones served with strawberry jam full of pieces of fruit. And I was very happy to see that there was clotted cream as well. Alongside there were a selection of dainty little cakes, including a rich chocolate brownie which I really enjoyed. And there was a big pot of tea for us to share. Personally I would have liked to have been offered a choice of drinks, but nevertheless I enjoyed my tea. Cathy popped in regularly to check if we wanted anything else, or needed an extra pot of tea, and we felt very well looked after at the club. All of this costs the amazing price of just £10 per person, for a minimum of two people. It’s certainly the best value afternoon tea that I’ve had, and was served in a very relaxed setting. Mark and I both felt that afternoon tea at Halesowen Golf Club is a lovely way to spend an hour or two, especially in the warmer months when you can sit out on the terrace. Thank to Halesowen Golf Club for a lovely afternoon!